A fantastic picture book biography about the “Queen of Gospel,” Mahalia Jackson. Even as a young girl, Mahalia Jackson loved gospel music People say she was born with nothing, but she had something – a voice that was bigger than she was. Life was difficult for her growing up, but singing gospel always made her feel “like a peacock with her feathers all spread out.” When Mahalia realized how powerful her voice was, she wanted to share it with the world. Her journey takes the reader from a record contract, to performing at Carnegie Hall, and all the way to the historic March on Washington – all without compromising who she was inside! A powerful story of staying true to yourself. From the time he was a little boy, Abraham Dee Bartlett loved animals. He spent every night reading about animals and dreamed of working with them when he grew up. In 1859, Bartlett was asked to become the Superintendent of the London Zoo. His love and respect for animals led him to become a pioneer in veterinary medicine and to create an environment for animals in zoos as we know them today. Check out Picture This! Teaching with Picture Books for my thoughts on how to use this book in the classroom. These are both new picture book biographies for me. They both look great–so many great bios out there now! It is so wonderful! Love the cover in Fur, Fins, and Feathers! Looks like it has unique illustrations! Thanks for sharing, Dawn! Thanks Dawn. I’m using your recommendations to make my final order for my school’s library. 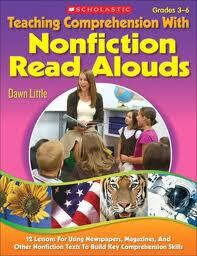 You know I love nonfiction!